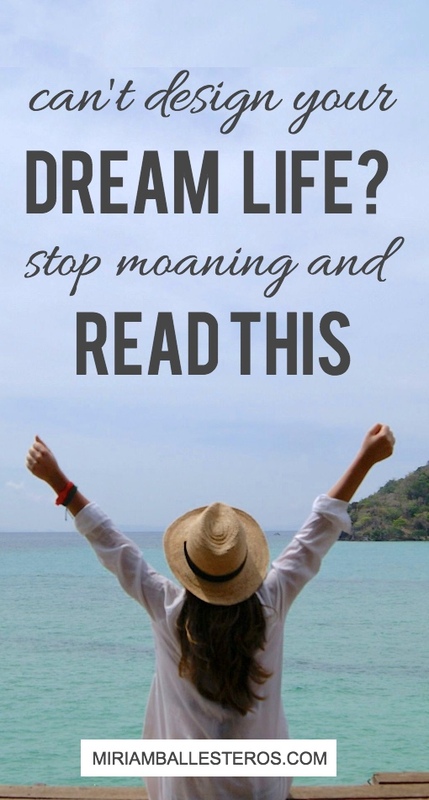 Can’t Design Your Dream Life? Stop Moaning About It And Read This. I have been doing a lot of work on myself lately and it’s paying big time. I’m the most committed, driven and courageous I’ve ever been. To know that you have control over everything you think, which creates your feelings, actions and results is the first step to design a life you love. I learned this in a Personal Development lesson by Natalie Bacon. Which brings me to this post! Here’s a look at my review of Design Your Dream Life Academy: why I took it, what’s in it, the part that you won’t find in any other course, what I loved and what I didn’t like about it, and how to decide if it’s a good fit for you. I took Design Your Dream Life Academy because I wanted to learn what else I could be doing to be my own hustler, and ultimately improve my life. I ended a 10-year-old relationship with my ex-boyfriend to pursue a more meaningful one, and for the past two years I’ve been sharing my life with the most incredible guy on the planet. I decided to have a more intentional and continuous relationship with my parents and brother, and our bond is stronger than ever (despite living in different countries). I created this blog just a year ago as a career development tool, and it’s taking me on a surprising journey. I proposed a new role at the company I’m currently working at because I wasn’t satisfied with my position. I started investing and managing my money more wisely. That said, I’m always in the lookout for new skills to learn that allow me to be a better version of me, both personally and professionally. So, I took Design Your Dream Life Academy because I witnessed the personal growth adventure of my good friend Natalie Bacon, and couldn’t wait to discover her secret sauce to becoming a boss at managing thoughts, emotions, actions, and therefore results. Here’s a little background about her to give you some context. You've probably heard me talking about Natalie from time to time. And that’s because she has an incredible story. Natalie is the life, finance and business coach behind NatalieBacon.com. She went from lawyer (in massive student loan debt) to financial planner, to full time online entrepreneur. She basically transformed her life from feeling overwhelmed, in a career she hated, with massive student loan debt to one where she’s literally living her dream life. Natalie is one of the most passionate women I know about her online business, and she lets that passion totally drive her. She has the time management, productivity, and goal-setting skills nailed down. She truly knows her stuff and knows how to implement it for massive success. And that’s what helped me decide that I should take a chance on the course. In Design Your Dream Life Academy, Natalie teaches SO much. The course has 95 lessons + 2 bonuses. It’s in a PowerPoint deck, with Natalie talking to you throughout the whole thing (kind of like podcast). You’ll hear all about how Natalie designed her dream life, and how you can apply the same strategy and tools to your life. The best part about Design Your Dream Life Academy that you can’t find in any other coaching course is a specific strategy for creating a life you love. Instead of focusing on changing your actions and hoping that something works, this course shows you how to manage your mind to get results. By taking this course, you will have a specific step by step plan for designing your life long term. I have read a lot of blogs and listened to a lot of podcasts about personal development. None of them gave me a step by step strategy specifically for mastering my mindset, emotions, productivity, time management, goal-setting, and habits. I can’t overemphasize how valuable this is. I'm facing problems from a totally different perspective. All in the same week, my boiler broke down (replacement was 2.000€), the couple living in my apartment in Barcelona told me they were moving out (meaning that I had 19 days to find new tenants), and my best work friend told me she was quitting (I was extremely sad). I didn't anticipate any of these things coming my way, but I separated the facts from the drama: I listed out the three objective facts (without personal judgments), and tried to find the simplest solution. I asked the landlord of the building if he would take care of the boiler replacement (and he said yes), I asked on Facebook if anyone was looking for an apartment in Barcelona (and found new tenants within a week), and I accepted that it was actually a good thing for my work friend to quit, and that we would still be friends "out of work". This thinking is helping me be able to always move forward, even when “life happens". I'm changing the way I look at priorities by not listening to what society says should be a priority (e.g. getting married before the 30s, and then having kids) AND by living the life that creates the results, legacy, and contribution I want to create. I'm working on being clear about what I want, because I know it's the only way I can be clear about my priorities. I'm saying “no” more often because I finally understood that it's at the core of managing my time. When I say no to other people and other opportunities I can say yes to myself. Of course, there are exceptions and emergencies that don't apply here. But I'm no longer in a state of saying "yes" when I want to say "no". I started using gCalendar even more seriously than before. I plan a month ahead at a high level, and two weeks ahead down to the hour. I put all the results and action items on the calendar, and it's being a game-changer. I'm being able to guarantee my results as much as I possibly can. I started documenting my failures to have a clear picture of all the things I need to "try again". Because each time I failed, I learned something new. And with each failure, I broke through a small barrier, which cumulatively will help me achieve mastery. What I love about Design Your Dream Life Academy is that Natalie showed me exactly how to create a strategy for taking control of my life and getting the results I want. As each lesson includes 1) an outline slide, 2) the substantive lesson slides, and 3) a summary slide, so it makes it really easy to be organized from the start - which I appreciated! I have no doubt about how to move forward with goal setting, and how to manage negative emotions (fear, doubt and failure) when life gets in the way of my goals. I learned that I can’t eliminate problems (because we can’t know good without bad!). It’s by accepting them as part of life that I can move forward. That’s why it’s SO important to separate the facts (math) from everything else (drama). I hadn’t thought about problems this way before this course. I also love that this course encourages you to experience the fear of doing things you’re afraid to do AND and do them anyways (because fear is just an emotion). The result of this? Courage. This lesson alone deserves a high five! Nothing is perfect so I also want to give you a heads-up about what I've liked the least. If you don’t put the steps of the course into action, then it’s useless. I admit this is not downside (sorry! ), but I’ll say that after taking the course I realized how much I have to do to get where I really want to be. As Natalie mentions at the beginning of the course “Design Your Dream Academy only works if you do the work”. And that's true! You have to actually implement the strategies, or else it’s just going to be a waste of money. Also, I kind of wish there was a specific Alumni Community to connect with former students who are also designing their dream life. It would be a nice place to get and give honest advice, share what’s working for us, what’s not, and keep us inspired and accountable! Now, let's talk about whether or not this course will really benefit you. Is Design Your Dream Life Academy right for you? Do you want to stay where you are right now for another year? Do you want to improve your productivity, time management, goal setting, or habits? Are you getting the results you want in your life already? Do you want more? Do you want to improve your mindset? What is that improvement and growth worth to you? I genuinely believe that this IS a really good course for you if you’re a go-getter who wants to improve your time management and productivity skills, or if you want to increase your focus. This course is also for you if you love to learn and care about personal growth, and want a specific plan for designing your dream life. This is the situation I was in and I learned sooo much from the course and am already seeing results. This course IS NOT for you if you don't believe in personal development and/or you don’t like to learn from audio and video. My advice is that you should only enrol IF you think it's a good fit. The Design Your Dream Life Academy is worth every penny. But you’ll only get amazing results IF you actually TAKE ACTION and do the stuff from the course. I know that because I’ve been implementing it in my life for the past two months and I’m already following a strategy to manage my mind, take control of my days and design my life long-term. So here’s to designing your dream life! P.S. A huge THANK YOU to Natalie for being such an incredible inspiration to me over the past year! I know she'll inspire you to design your dream life too. P.P.S. If you are on the fence about taking Design Your Dream Life, you can write me an email. I’m happy to answer questions.